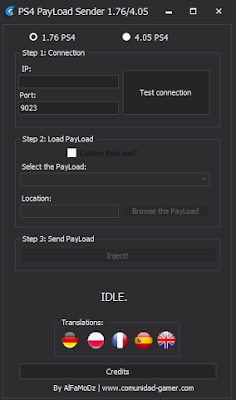 Today developer AlFaMoDz has released a new homebrew named PS4 Payload Sender 1.76 4.05 for the Playstation 4. Check out the release notes, changelog and the download link provided below. Application developed in C # .NET 4.6.1 to send PayLoads to our PS4 in an easier way and with an interface to facilitate its use. 1. A Windows computer and .NET Framework 4.6.1. 2. A PS4 in version 1.76 or 4.05. 3. Internet connection (A wired connection is preferred). Translated to several languages by natives. Ability to add in the folders "1.76" and "4.05" PayLoads that you frequently use. Save the IP to which you connect. Selection of PS4 firmware version to change the port automatically and filter compatible PayLoads. Future improvements in following updates. Automatic saving of the selected language. ZeraTron: French translation, help and ideas.